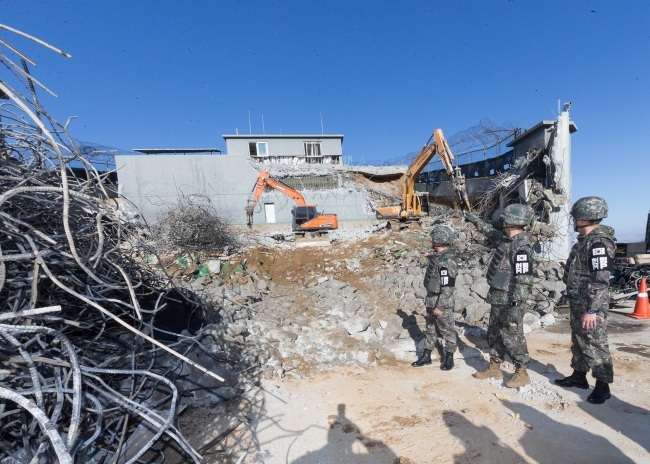 With the two Koreas’ militaries completing the withdrawal of troops and firearms from frontline guard posts over the weekend, the work is underway to destroy 20 guard posts in the spirit of continuing inter-Korean reconciliation. The South Korean Army said Monday that it had begun destroying 10 guard posts on the southern side of the heavily fortified Demilitarized Zone. The dismantling work will be completed by the end of November and followed by a verification process in December. The two Koreas’ defense chiefs pledged during the inter-Korean summit in September to remove all guard posts inside the DMZ, starting with the withdrawal of guard posts within 1 kilometer of the military demarcation line as a “preliminary measure.” The two Koreas are believed to have a total of 220 guard posts in the DMZ. “The irreversible destruction of guard posts is the most visible and symbolic measure to prevent accidental skirmishes and build trust,” said Army Chief of Staff Gen. Kim Yong-woo, who visited the DMZ on Monday to observe the destruction work. While the two Koreas had originally agreed to destroy a total of 22 guard posts, the two sides’ militaries decided to preserve one guard post on each side of the DMZ for their historic value. The North Korean military is reported to have asked that one guard post, which North Korean leader Kim Jong-un had visited, be preserved. In return, the South Korean military decided to retain one of its own guard posts in the eastern part of the DMZ. The Ministry of National Defense said, while it could not confirm which side had floated the idea first, the two Koreas had “shared the need” to preserve the two guard posts in a series of cross-border military talks following the inter-Korean summit in September. “We have continuously talked about the need for preserving and withdrawing (guard posts). In this context, we have consulted each other and reached a common understanding,” said Defense Ministry spokesperson Choi Hyun-soo. The guard post preserved by North Korea is located about 350 meters away from the South Korea-controlled area inside the DMZ. Kim Jong-un visited the frontline post in 2013, when tension was high between the two Koreas. According to defense officials here, North Korea operates about 160 guard posts inside the DMZ along the 250-kilometer-long swath of land. The South Korean military is believed to have 60 guard posts within the DMZ. Meanwhile, the militaries of the two Koreas and the United Nations Command held another round of working-level talks on Monday to discuss how to operate surveillance equipment after disarming the jointly controlled area inside the DMZ.